Hooray for finishing January SavingsPinay Series! Thank you for spending your time reading the posts and supporting this blog. 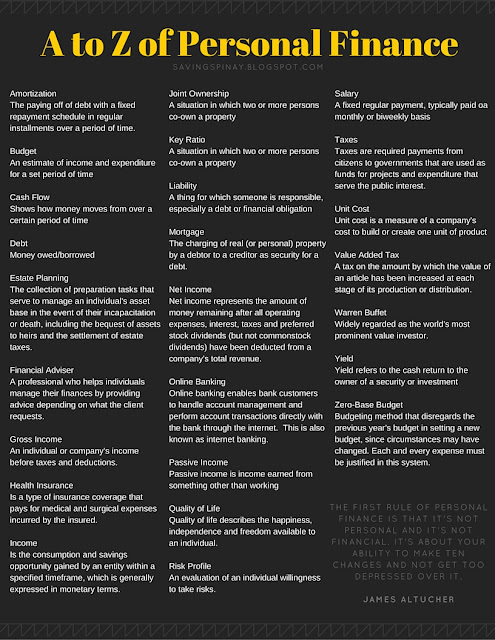 We have arrived finally on the overview of the series and at the end of this post I will be giving a free infographic on the A to Z of Personal Finance you can download and share to anyone. A financial plan starts from a vision. A goal, a dream and an statement of who and what you’ll be one year, five years, 10 years from now. We’ve talked countless times on how to set goals but how do you achieve them anyway? 1. You need to write them down. Don’t stuck your dreams in your mind. Make a list…lots of lists. Put those ideas in a paper you can see every minute of the day that you can go back to from time to time. Once you have written them down then you must ensure that you put it on a place you can easily see. I’ve written my goals in my Master Bullet Journal and publicized it on my blogs later. This way I have set my mind that no matter what I’ll strive to achieve my goals especially now that everyone can see them. Here’s one thing that made a big difference in my life starting this year. I learned that if I want to achieve my goals I should — I must make them part of my priorities. All my next actions should be in aligned to my goals. For example, one of my work goal is to not be late anymore at work. And so I put going out of the house by 6:30am as a my next action. I knew that if I start my commute time by 6:30am I can avoid the morning rush and arrive at work early. The result? For 3 consecutive weeks I was early at work. If you want to achieve your goals you need to set all your next actions in accordance to that goal. God’s plan is way better than your plans. His priority is to make you prosper. Remember that planning your finances is a spiritual command. We are all obligated and mandated to take care of the resources that God had entrusted us with. We have to make sure that we don’t waste our talent, our time and our money for nothing. Allow God to speak with you in your visions. Be ready to listen to His instructions for He will be the only one who’s in total control. Once you have submit everything to God, you can now establish a better understanding on how your finances work. On Day 1 I have shared the Top 5 Personal Finance Basics. This list includes Budget, Savings, Spending, Investment and Retirement. These five are the very five things that you need to learn and to master in terms of financial planning. You need to make a budget and make it work for you. You need to get serious about retirement. On Day 2 I gave seven elements that will make you create a solid financial plan. On Day 3 we were able to include a massive list of personal finance tips everyone ought to follow. I gave the Top of the List which was taken on my Top 10 Most Important Lessons in Personal Finance. I also gave tips in increasing your income, managing your money and becoming rich. I also included 40 more tips from my 40 Financial Habits for Life. On Day 4 which happen to be the last installment of January SavingsPinay Series I have compiled the best and smartest financial moves one should do in their 20’s, 30’s-40’s and 50’s to 60’s. Planning for your finances takes a lot of courage. There are days you will feel discouraged when you fail a goal or a habit. However you need to conquer your fears and strive harder than yesterday. Visualize your dream life and enumerate the next actions that will make that dream come true. 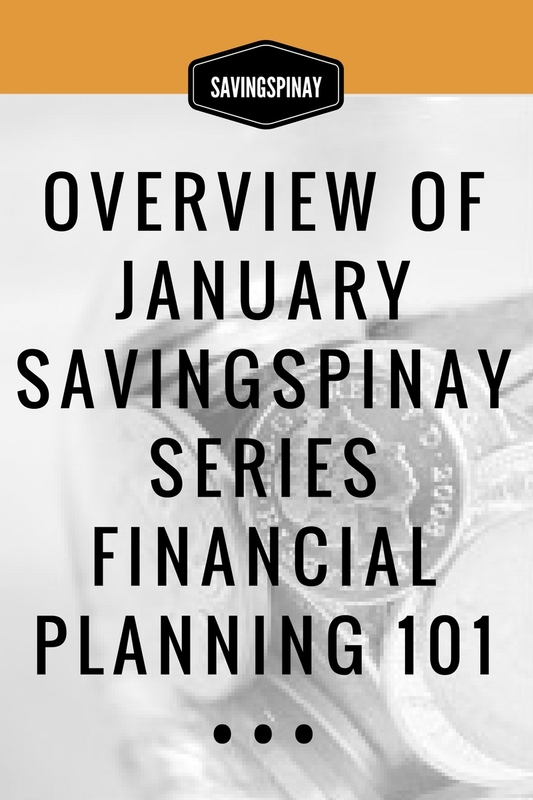 Thank you again for being part of this month’s SavingsPinay Series.